My 10 month old, who we were sleep training (using CIO), falls asleep regularly sitting up. Last week, for example, he slept sitting up for 4 hours straight. His motor milestones are on par. 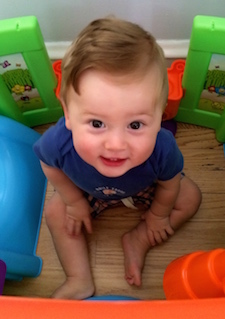 He crawls, sits up on his own, can pull himself up and stand and can sit down from the standing position. I have tried to go in and lay him down on his back once he falls asleep but when I do that he will immediately wakes up, cries briefly, sits up and falls back asleep in the sitting up position. He seems to be well rested in the mornings, but I just feel horrible going to bed knowing that my little guy is sleeping sitting up. I’ve been hoping that he'd figure out how to lie himself down but so far he hasn't. I'd really like for him to sleep in his own crib and lying down for that matter, but the whole sitting up and sleeping has really thrown us for a loop. Have you ever heard of this? Do baby's eventually learn to lie down? We now just let him sleep in our bed. I’d like to try CIO again soon. Any advice you have would be much appreciated. Eight children and 16 years of pediatrics and your son is the first child that I’ve ever heard of regularly sleeping sitting up. I’ve got think he is going to do great in college - ok sorry for the lame joke. While this is exceeding rare and odd, I do not think it is a sign of an underlying medical problem. My guess is he could and knows how to lay down he is just a dedicated protester. I assume that he sleeps well laying down when you co-sleep and when he falls asleep in his car seat. You could use your co-sleeping or nap time to “train” him to lay down and go to sleep. The idea would be to place him with you standing up in a bed (I’ll leave the safety specifics up to you). Hopefully he would learn to lay down and fall asleep with you. Once he has mastered the skill, then return to crying-it-out. Expect crying-it-out to be harder the second time through. If he remembers the last time you attempted to cry-it-out and remembers that he eventually got his way, he will be an even more persistent crier. At your stage of the game, crying it out is the only reasonable option. Its always ugly, but with persistence it always works. His crying will worsen before it gets better. Usually, a child’s fifth night is the worst. Do not attempt to cry-it-out until both you and your husband are fully committed. If you do have a second child, lets start to work on good sleep habits early in life, so we can avoid the ugliness of crying-it-out. My son is officially sleeping in his own crib all night. We were in and out of town for the past couple of weeks so we started letting him CIO on Monday night. On Monday he cried for about an hour then fell asleep sitting up for another hour and half before finally laying down! On Tuesday he did the same thing but figured out how to lay down within a couple hours. On Wednesday it only too him 10 minutes of crying and then he laid down and went to sleep. Last night he did the same thing. He's staying in his crib all night now and my husband and I are getting a full night's rest, which feels amazing! We are now working on getting him to nap in his crib, which is going well so far. Thank you very much for your advice. We really appreciate it.